This week’s offering is a Cake. “To Die For” 6.5" x 5" x 5" Hand constructed Red velvet cake, with vanilla icing. 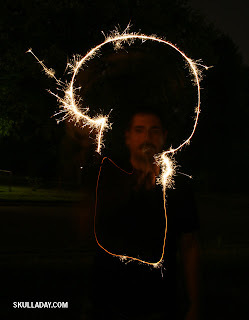 Today’s post is marking the end of year 3.0 for me. Can you believe that it has been a year already? You have all provided me with a great amount of inspiration as I journeyed to complete my weekly projects this year. So to you all I share a piece of this cake and raise my Tatman Glass to toast you and the beginning of year 4.0 which starts later this week. C-Rations will continue in 4.0, but look for me on my new day next week, Wednesday. 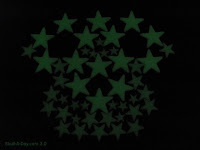 Each Monday during the 3.0 year I posted an original skull design. My weekly offerings were nothing compared to the one-a-day massive project done by the Skullmaster in 1.0, but hopefully you found some nourishment in those weekly offerings. Need more nourishment during the week? You can always Friend or Follow. As the last Sunday in 3.0 brings this year to an end I wanted to post a few simulacrum that were actually made instead of being found naturally. This is a dedication to all of the contributors who have kept Skull-A-day rolling into the next year of 4.0. Tim Grueschow of Oshkosh, WI writes, "I'm a Graphic Designer, and we are wrapping this 2002 GSX-R 750 .. 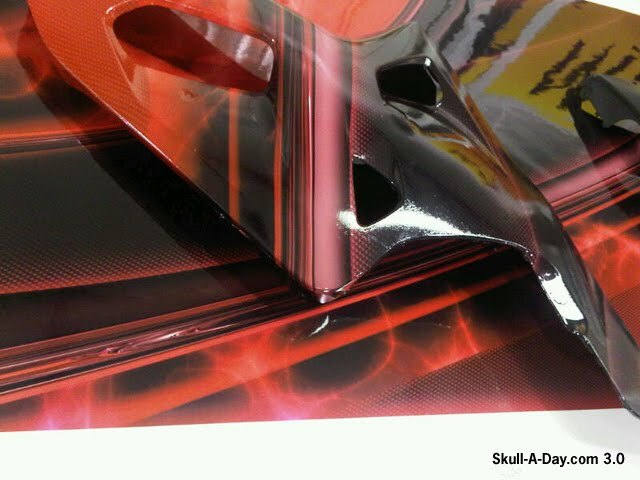 The fairng laying on top of the wrap material caught my eye ... Holes in the fairing produce eyes and nose... And the pattern on the wrap beneath.. teeth. Purely serendipitous." John Karpinsky tells us, "I've been perusing your site for a while, it's always entertaining. 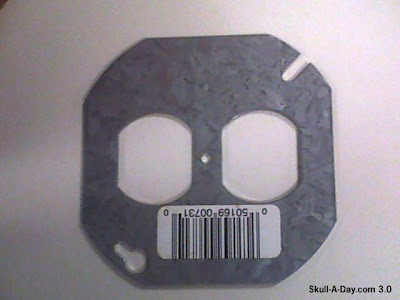 Not sure if this counts or not, maybe I'm just seeing things, but this looks like a skull to me." Eric Vinyard and Lauren Jennings were skull hunting together when they found this one lying on a shelf at Diversity Thrift. "I think it's a wall socket component, but they sure put the bar code sticker in the right spot." Thanks again to all of you who kept our Sundays filled with images of skull simulacra for this past year. 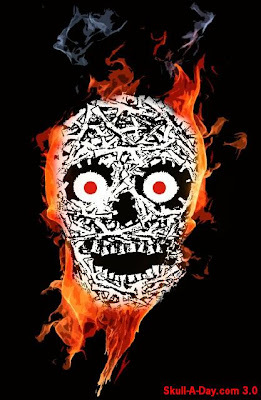 We plan on keeping this tradition going into year 4.0 so keep your skull eyes open and continue to submit them for the rest of our readers to see. Just remember that since we only do this once a week it may take a bit longer to get posted, but it's always worth it. Thanks! Chresten Ibsen of Denmark wants to give us something to chew on. "Was cooking some vegetable & bacon dish in a million pieces / pixels and suddenly came up with this one on the cutting board. My kid - Markus - 6 yrs thought it was cool, so we photographed it. Didn´t know about Skull-A-Day till a friend told me on Facebook - after I posted it. Later, we all ate it among a lot of carrots and onions." 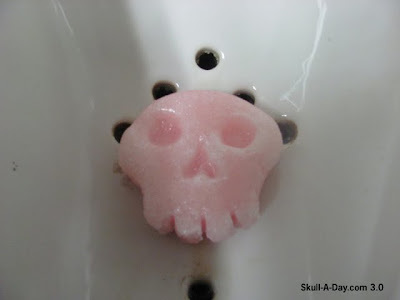 Food skulls are always some of the most popular, and probably some of the most fun to make. 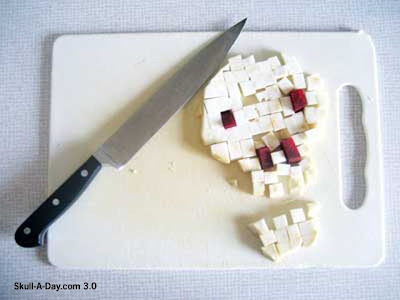 We were always told as children not to play with our food, but in the name of skull making I say go for it. 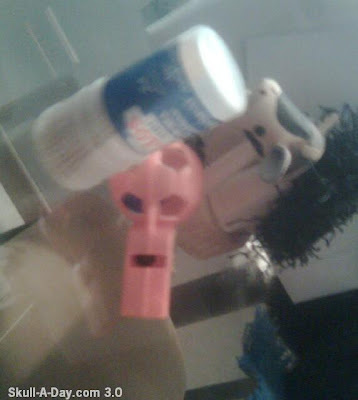 Besides, you can always eat your creation later like Chresten did. 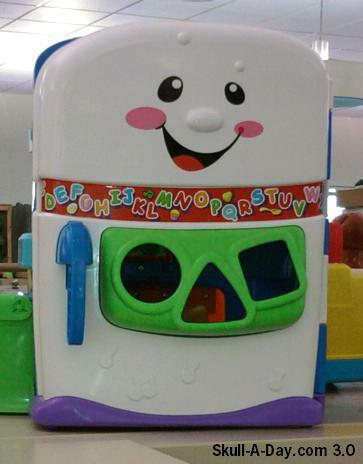 Thanks for sharing this with us and your friends! I spent a warm summer evening with my girlfriend on a grassy patch, outside of the pool I belong to, making these for an hour or two. It took about twenty tries to get about four decent looking ones of which this was my favorite. I had my camera on a tripod and most of the exposures took 6-7 seconds. 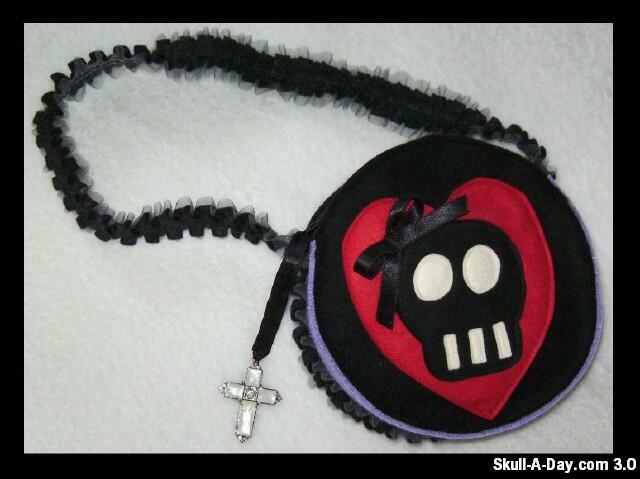 So if this wasn't your favorite of my original 365 skulls, what would have you made as number one? Paul from Paul and Kate Studio in Richmond, VA created these handmade ceramic cups. Looks like you are Big Skullin’ down in R-I-C. I really enjoy handmade ceramic mostly because every one is unique no matter how similar they look to something else, there are still factors that make it a one of a kind. 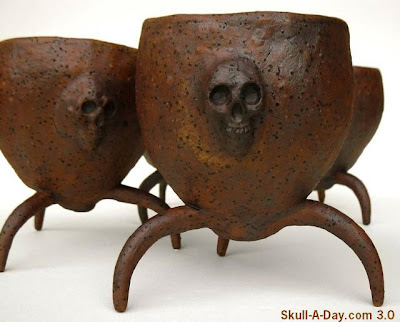 I also enjoy how this piece loses the traditional base and incorporates the arm like structures that make this appear as if at any moment your cup is going to walk away. Thank you for showing off your work to us. Chester, UK is the home of one Rae Welch who sends us this lovely paper skull. Here's some info about it: "This is the illustration I have made for the book cover of Perfume by Patrick Suskind for the UK Penguin Design Award 2010. It is made from the actual pages of the book and represents the main characters final death scene (if you haven't read it, it is quite...skin tearingly graphic)." 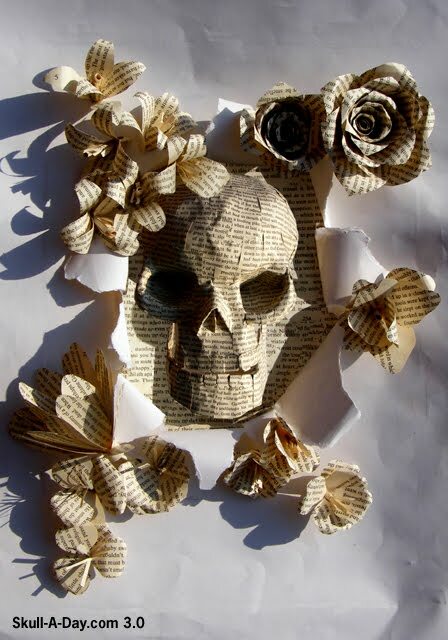 I am amazed at the detail you put into the skull as well as the flowers. The whole piece is great and would make an excellent cover for the book. Mark Twain once said, "The man who doesn't read good books has no advantage over the man who can't read them." Perhaps this post will inspire our readers to get into skull making AND to pick up a good book. Thanks, Rae! I was eating lunch the other day at a local sandwich shop, which just happens to be next door to where I painted my Graffiti Skull, and the owner asked if I'd taken a look at the piece lately. I hadn't so I strolled around the corner and discovered that the Virginia Creeper has continued to overtake it in such a lovely way. The bonus is that it dies back each winter and so the piece is entirely revealed again before getting covered over in the spring/summer once more. You can see how it looked a year ago HERE. I really appreciate you sharing the story behind this piece you have created. It is not often we get to see the process of making art in which each step could stand on its own as an independent piece. Thank you for sharing this work and it's creation with us. 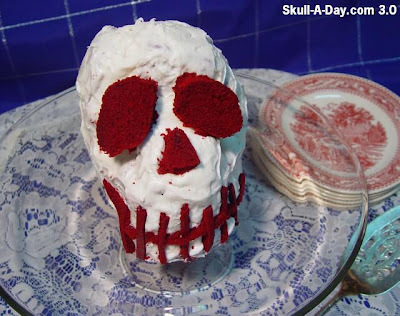 Also we love to see skull cakes so if you happen to have an old picture of it please send it in. If you've been reading Skull-A-Day for a while then you know that we've featured many skull cakes in the past. Well, in my quest to bring you some of the most unusual skulls I can think of I present to you this different type of skull cake. This may look to be one of the grosser skulls I've done, but it actually emitted quite a fresh scent while I was carving it(even though my wife totally disagrees). It does make me wonder though, are these common all over the world or only in America? Do we have any international male readers who can help me out here? Anyone? 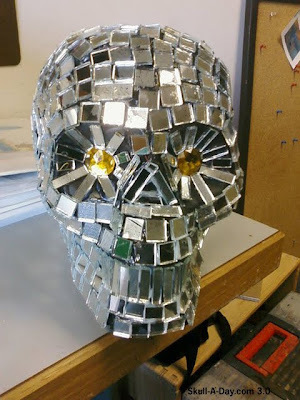 This dazzling mirror ball skull is a handmade beauty from Ronn Campbell of Kennewick, WA. 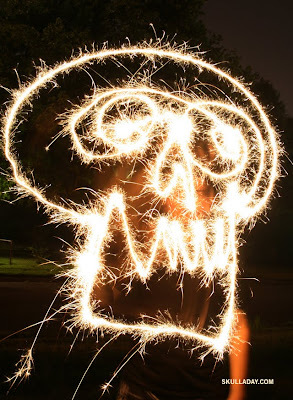 He writes, "Made a paper-mâché cast of an existing skull. Filled with a combination of foam and wads of paper-mâché. Ordered the mirror tiles online and started gluing." Mirror mirror on the skull, who's the life of the party and never dull? You are! 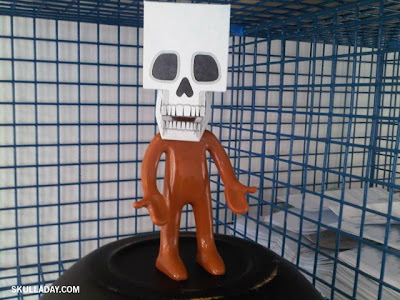 This is a great skull that is desperate for attention. All it needs now is a place to hang, some bright lighting, a bunch of wild and crazy Skull-A-Day readers to fulfill it's destiny. Thanks for sharing it, Ronn. Now I need to go break out some disco music. This week’s offering is Cans of the aluminum type. 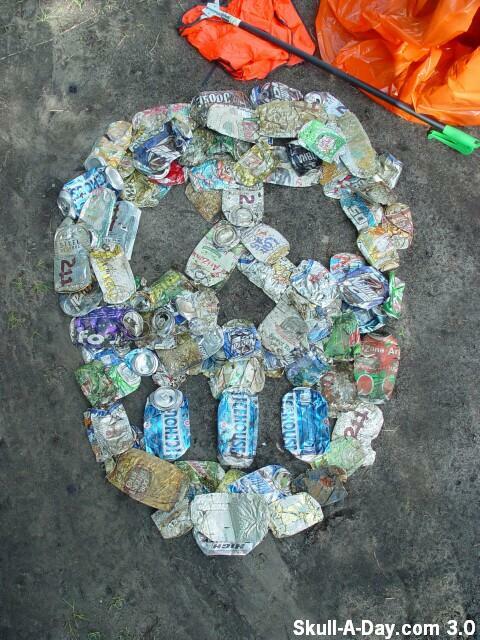 “Second Life” 48" x 36" aluminum cans collected and arranged. Since I am unable to get to the Gulf to offer my assistance, I decided to do something small for my community. There is a culvert at the end of the street that serves the purpose of collecting rain water in order to properly channel the water to avoid flooding. It does an excellent job in what it is suppose to do. On the other hand, it has also acquired an unintended purpose, to collect all the street trash that washes down the gutters. Just a few hours of my time and now a few less bags of trash will make it to the oceans, and the glass, plastic, and aluminum are being sent to recycling. We all may not be directly affected by the environmental catastrophe that is happening to the Gulf, but we can all do a part in making other local environments more hospitable. I challenge all of our friends out there to do something positive this week, some of you have a long weekend coming up, so give a darn and go pick some stuff up. For your listening pleasure I offer a couple of selections that I was reminded of by viewing today’s selection of skulls. No surprise here, and this one. There is also a pop cultural reference to a flaming skull here, that came to mind when I saw today’s submitted work. Of course there is also the Skullmaster's work here. The underlying inspirations however, are best left to be interpreted through the relationship the work fosters between the artist and the viewer. Thank you both for submitting your work for us to share and we look forward to more of your work in the future. The bags are for sale on my mom's Etsy page HERE. And since I doubt I'll ever be making any of this fabric again, this is probably one of your only chances to get your hands on it! This week’s simulacra are safe for children. The Youngest arrived via Gary C from New York. 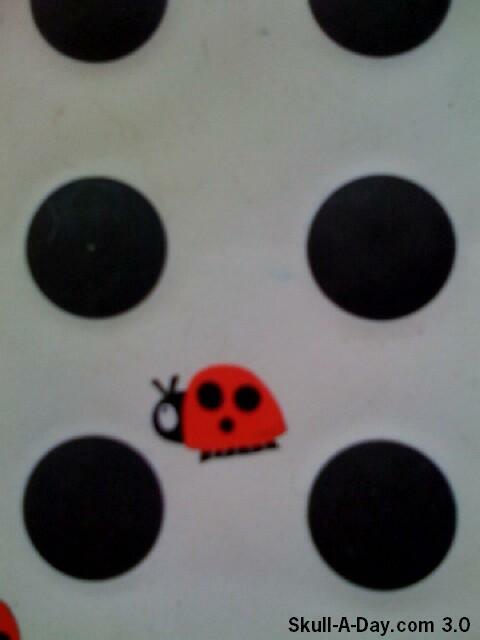 Who spotted this skull in a child’s toy. Usually we might find skulls marking places of danger that kids should not go near. 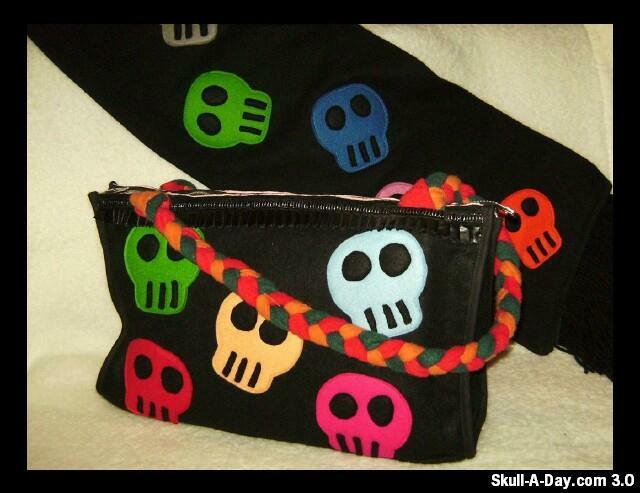 These skulls, however, are OK for kids to be near. 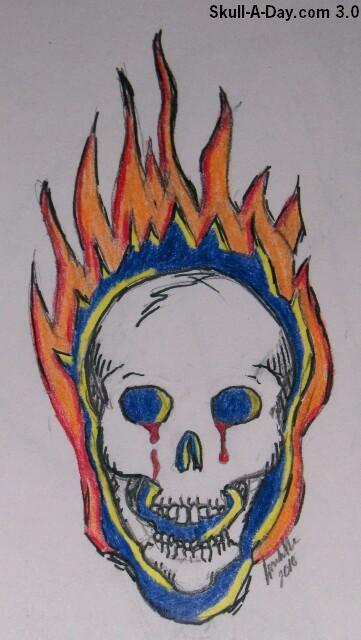 Thank You for all for submitting your skulls to be shared. Italian graphic designer Funboy is here to add some color and fun to your weekend. His first submission is this awesome set of custom painted Vans(which always seem to be a big hit with Skull-A-Day fans). And next up is this sweet painting titled "Unlucky You". 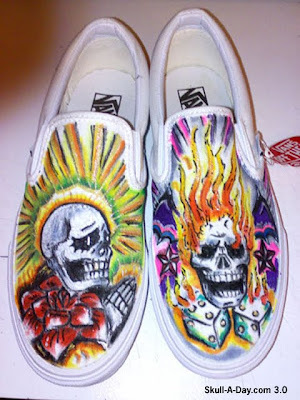 I'm sure that the "inskullrations" flow freely when you wear these shoes. The painting is just one of many skull related pieces you can check out at Funboy's site or blog. I really liked everything I saw, Funboy. Thanks for submitting the great works. My friends Carol and Dave kindly offered a wall in their house (in their utility room actually) to do with as I saw fit and so I decided they needed some wallpaper. 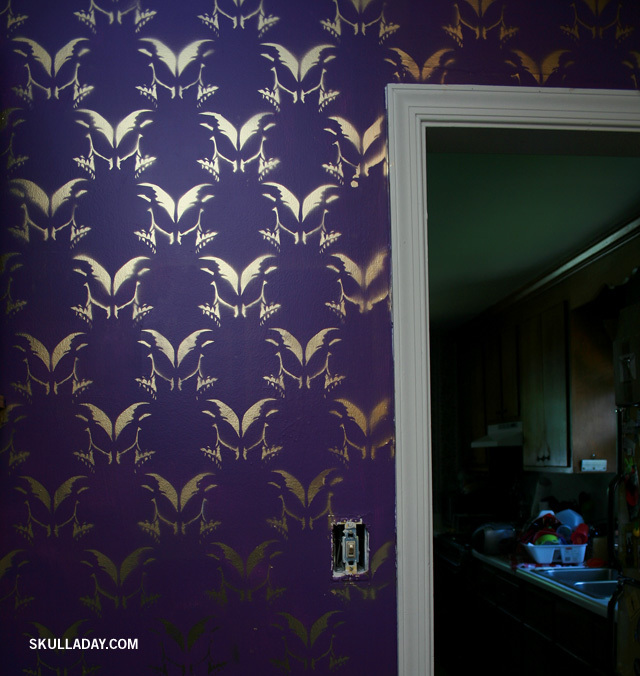 They painted the wall in advance and then I came in with my stencils and a lot of gold spray paint. As with all of my stencils this one is available as a Creative Commons licensed FREE downloadable PDF to do with as you like HERE. Here's a bathroom where it was used already! Please do send along anything you do with it so I can share it on the site as well. 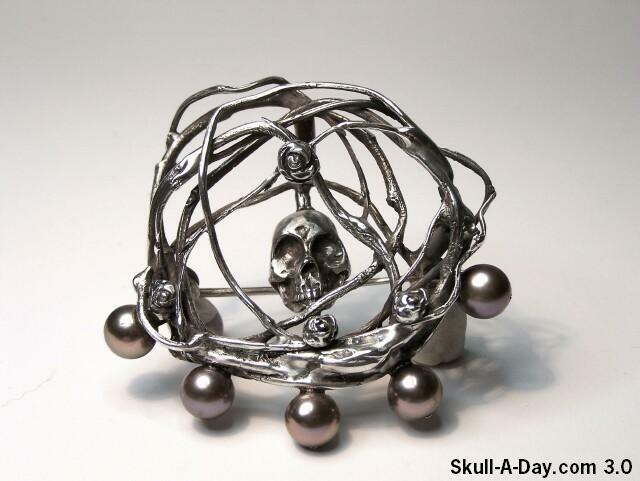 Ruth from Los Angeles, CA made this skull wreath brooch. 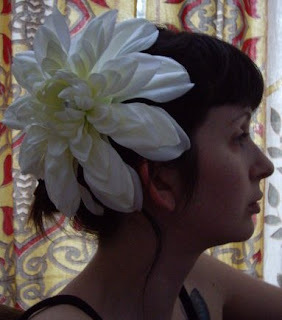 This is a great piece of wearable art you have created. When I saw this, I immediately thought of Mourning Jewelry that was fashionable in the 19th century. 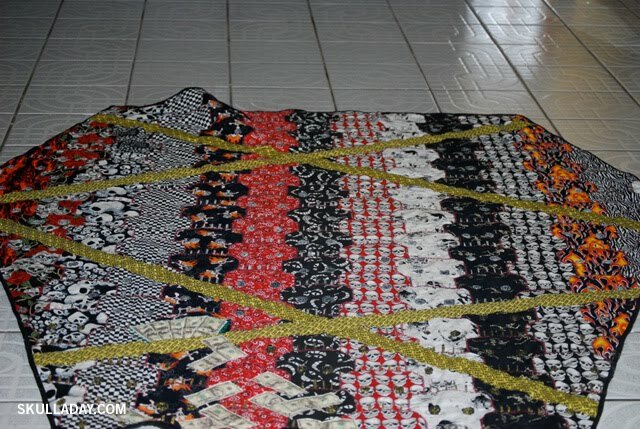 After looking at this for a while I picked out a pattern that seemed to resemble that of an atom. The skull serves as the nucleus and the roses and pearls look like circling electrons. Maybe you have created a new element here. Thank you for submitting your work to us. 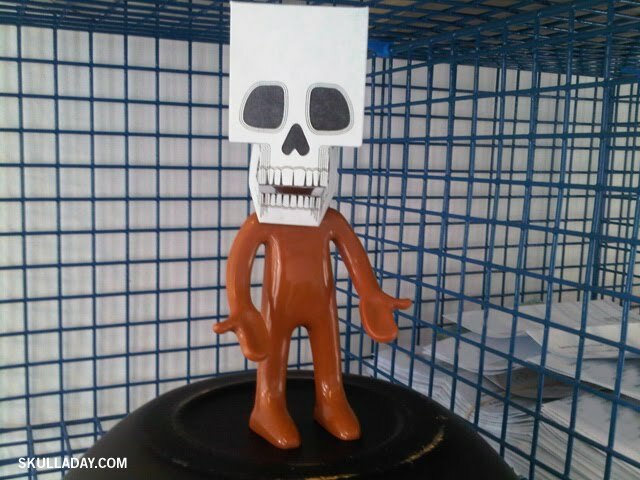 Stevo in the UK says, "Cracking site, been a follower for a quite while now and loved the recent Papercraft Skull…couldn’t resist brightening my day in the office." This demon skull comes from the darkest depths of Ken VanCourt's imagination. He tells us more, "I'm an artist from upstate NY. I began a project about a year ago to create varied skulls converted from "Bucky" skulls, provided by our good friend Jeff Nix at MrSkeleton.com. 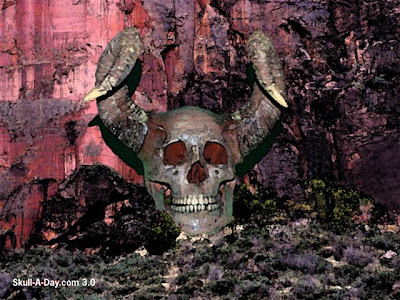 My 'Demon' was created by converting a Bucky and the recast of a pair of ram horns." This is awesome work, Ken. I really dig the oversized horns for their over the top effect of evilness. Plus, your picture looks like you found this skull in a deep, dark cavern of unseen horrors. 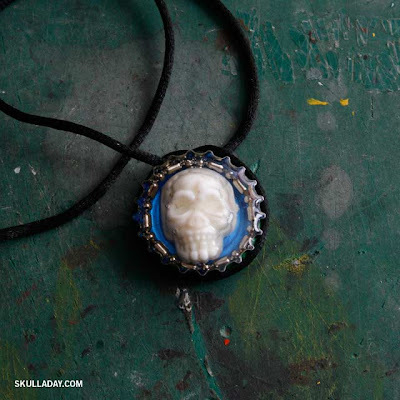 Your site has tons of great skulls and I highly suggest our readers to check them out. I also know of a certain Skull Master who has a certain profile picture that looks eerily similar to this. Thanks for the great submission, Ken. 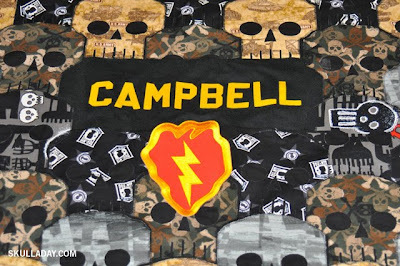 Tiffany Berkovitz of The Quilted Skull made these absolutely incredible quilts using my Interlocking Skull Pattern! 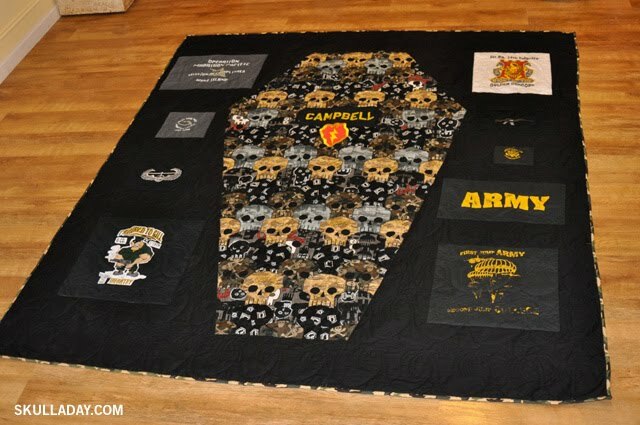 She says, "I made a coffin shaped quilt for my son... and his teacher at school saw it when they went on a class trip. 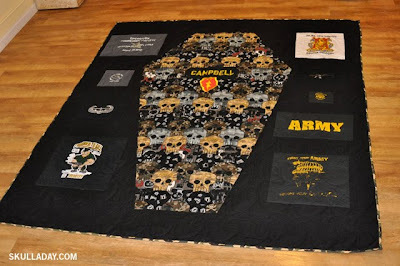 He was in the army and wanted the same quilt, plus his army t-shirts so we decided to make the coffin shape with the skulls in the middle." Jean-Eric from France, a long time friend of Skull-A-Day, sent us this amazing piece he constructed out of recycled cardboard. You can read the full story about it here. 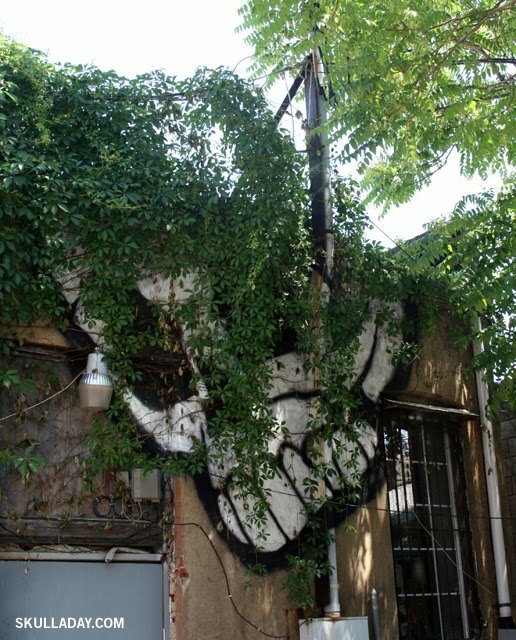 ** Another of J-E's outdoor public installations, a jumbo paper skull, was featured here in Braincase V back in 2007 near the start of the original Skull-A-Day site. There is not much more I can say about this excellent public installation piece. I really love this work. Thank you so much for sharing it with us. I look forward to seeing more of your work in the future. It's amazing how kids can inspire you sometimes. 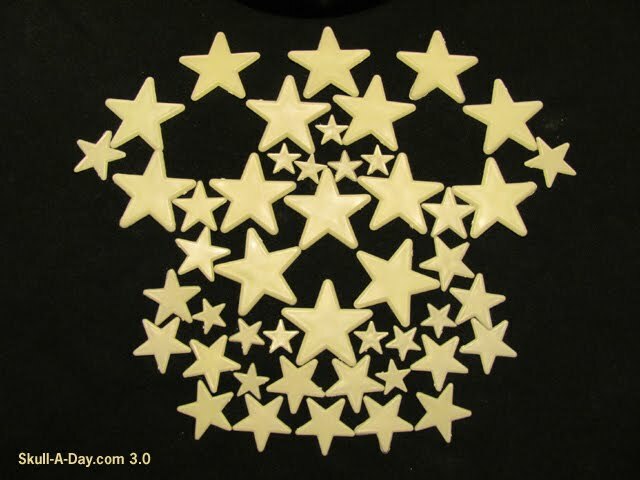 My 4 year old son(who is also a big Skull-A-Day fan) really liked having these stars on the ceiling in his room so we bought him another pack at the store the other day. Then out of nowhere he suggested, "Daddy, you could make a skull out of these stars." So I gave it my best effort for him and this is what I came up with. Thanks to my boy for the good idea. He was excited to see it and to be a part of making it. I hope I never overlook the great ideas he'll come up with as he grows up. This nifty painting comes from Harek of Ingebrigtsen, Spain. "Hey! Recently I've been fiddling a bit with watercolors, and find bones to be very gratifying "models". 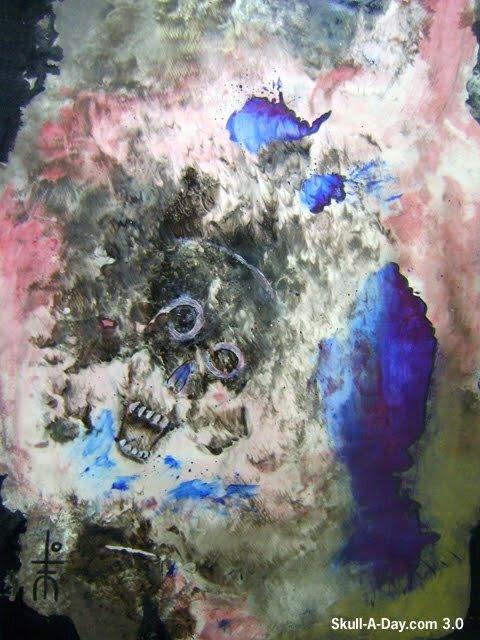 This is an early skull, painted this in 2008 on a night watch." I really dig the simpleness of the two tone design you created. It gives your "model" a great primitive look like something out of an old horror novel published long ago. Possibly an illustration for "The Screaming Skull" by F. Marion Crawford. Thanks for bringing us a basic lesson in spookiness. This week’s offering is Currency. 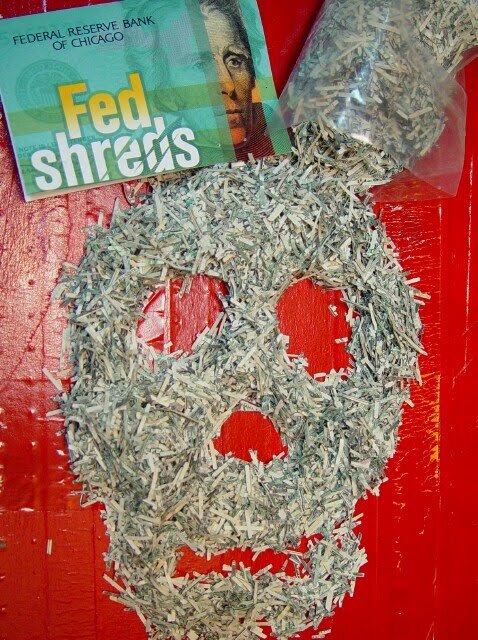 “Fawn Hall” 8" x 6" Shredded US Currency arranged. If you ever happen to find yourself in Chicago, you should make an effort to stop by the Federal Reserve Money Museum. It is not included on many of the “must see” lists, but it is well worth the time, and if you plan your visit right you may just have a chance to meet with an agent of the reserve who may just significantly open your eyes to the behind the scenes aspects of banking. You also get to leave with a gift courtesy of the Federal Reserve, real shredded money. This dead money, as the card explains, is money that is unfit for circulation due to its condition. Most of it is sent to authorized landfills, but some is sent home with each visitor who stops by. 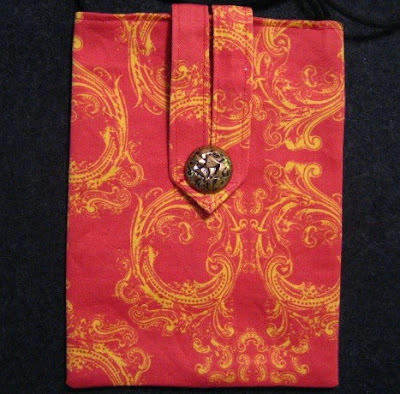 Sheila from the Netherlands told us that: “Your page captured my heart.” She also sent us pictures of a couple purses she made. Some may say that this work really brings this outfit together. 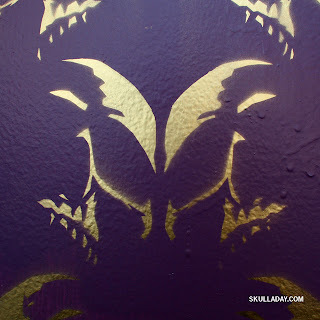 I truly appreciate the highly stylized shapes of the skulls in your work, and the mixing of colors in different work really makes each piece unique. Thank you for submitting these wonderful pieces you created. 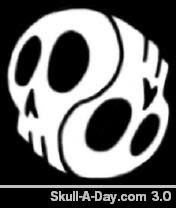 By the way, thanks also for sharing Skull-A-Day on your art page, it is great to know that we are inspiring artist in their creative endeavors. 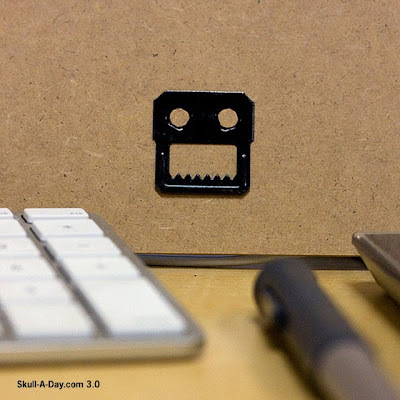 Skull-A-Day News: New Editor for Year 4! 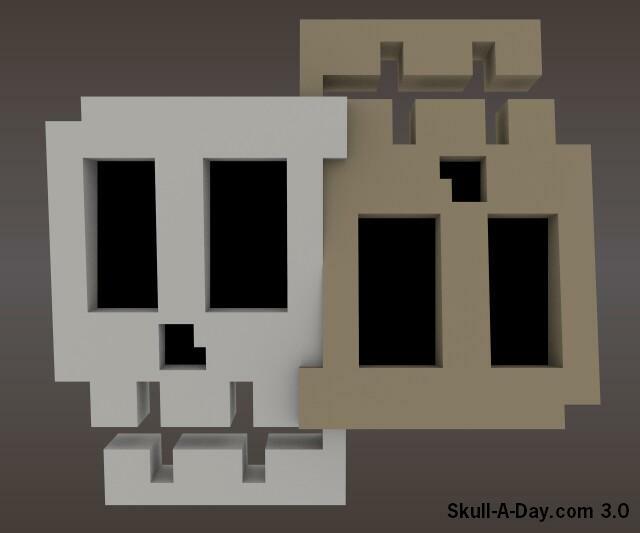 Year 4.0 of Skull-A-Day will be starting on June 3rd and a bunch of exciting things are in the works... The biggest news is that we are bringing a new editor to our happy skull family: Abby AKA Azurafae! You might recognize her name as she has been a regular commenter and submitter for the past year and also just happens to live in my hometown Richmond, Virginia! You can read more about her in her bio HERE. She'll be joining Tatman and Citizen Agent in selecting and posting your submissions throughout year 4 as well as creating her own weekly submissions. Please give Abby a hearty welcome and keep an eye out for her work in the near future! 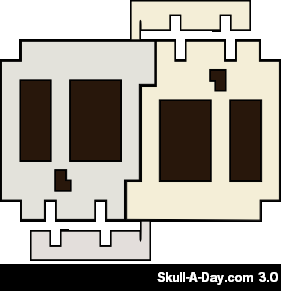 As skull lovers we all know how bones can resemble stones and today's submitters are here to prove it. First up is Diane who sent us this great looking rock. She writes, "Yesterday I found this awesome rock with a hidden skull face in it at an exhibit of bonsai and rock gardens, and thought immediately of your blog. I hope you like it!" Next up is Josh Hartley who made a great discovery on a hike. "I saw this Skull rock, that before being buried, or as soon as the soil erodes was or will be a full skull rock. I thought it was quite interesting seeing as it was half buried and the spring flowers were coming up in front of it’s nose. Symbolic? Hey, they say we see what we want too. I will leave that up to you. 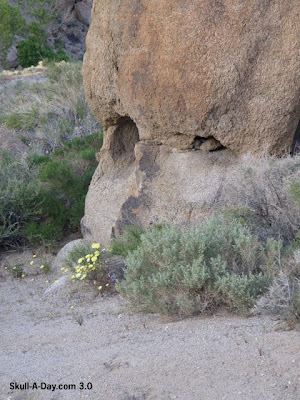 The location of this photo is in the Alabama Hills, just west of Lone Pine, CA. and just East of Mt. Whitney. 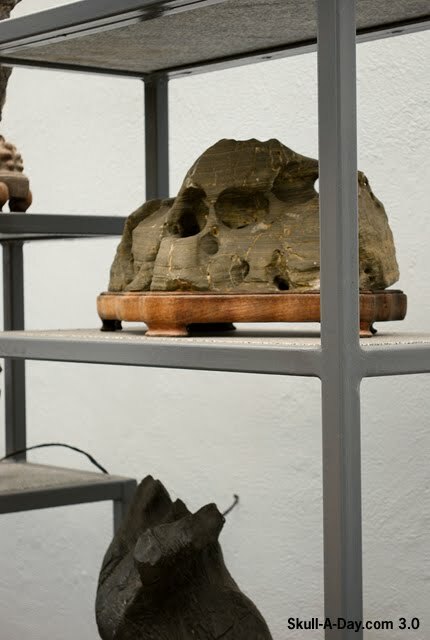 I like to call this one “Ole’ 1 eye has yet to show his face”"
And lastly Amanda Hicks brings us what might be one of the largest skull simulacra ever. She wonders, "if the people of Portland see it driving north on 205." Thanks to all of you for catching these stone faced skulls and sending them in. It really makes me wonder if Mother Nature is trying to show us her rougher, tougher side with these. 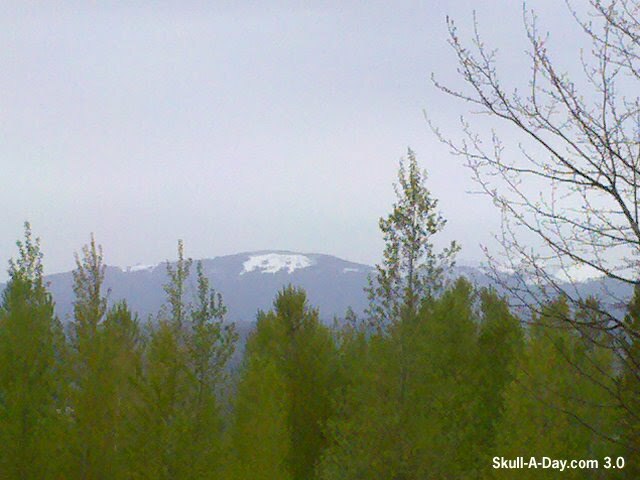 If any of the rest of you catch a skull or two on your next outdoor excursion then be sure to submit it. We love seeing what the great outdoors has to offer. 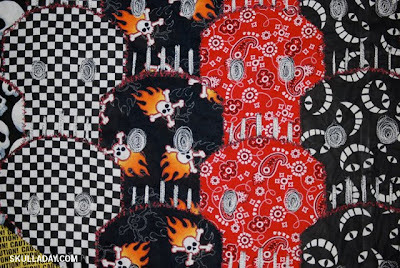 Today's tremendous trio of skulls comes to us from Brazilian artist Marcos L. Britto. They represent a progression of his styles over a five year period. I'm not much of a fine art person, but I know what I like when I see it. 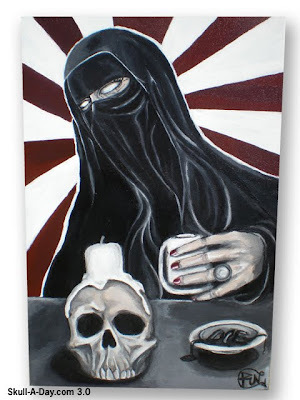 Of course I like all of these for their skulls, but the way they appear tell me different things in each painting. The colorful schemes give them a lot of texture and life. Thanks for submitting them, Marcos, and for speaking to us in the language of art.